****Please send a message for short term monthly rental rates and availability. Leave the city traffic and congestion FAR behind when you visit the River Song Cottage on the Historic Suwannee River. Shaded by giant oak trees this cottage features a large deck overlooking the river. Also a second large deck right on the bank of the river. This is the perfect place to escape, relax, enjoy the REAL Florida and all its wildlife. Location is in Lafayette County, five miles north of Mayo. This is 35 miles (45 minutes) from Spirit of the Suwannee Music Park and 40 miles (55 minutes) from Stephen Foster Memorial Park. Maximum # of guests is 6 (up to 4 adults) and is strictly enforced. Snowbirds welcome! Check with us for deep discounts on extended stays in the months of NOVEMBER, DECEMBER, JANUARY, FEBRUARY, MARCH! EMAIL FOR AVAILABILITY!!! We keep a master calendar on our properties and do not always update VRBO, so email with requested dates for quick availability check. Lafayette Blue Springs State Park 1/4 mile down river, numerous natural springs nearby. Just 30 miles from the Gulf Coast beaches. 25 miles to Spirit of the Suwannee Music park. 30 miles to Steinhatchee. 35 Miles to the Ichetucknee River State Park for tubing on a crystal clear spring-fed river. This area is a diver's paradise! 45 Miles to Wild Adventures Amusement and Water Park - awesome rides, water park and live music shows included in ticket price. Loads of fun without the crowds and traffic of Central Florida theme parks. The Cottage is completely furnished and has recently been renovated with new carpet and ceramic tile. Bring your food and fishing pole. There is a boat launch within one mile. We have two canoes and a kayak on site, with paddles and life vests. This is a great get away for couples or active families! The interior is nicely decorated. Initial contact via email is preferred and we will send additional information on the property including a list of frequently asked questions. This is one of the few remaining sections of Florida that are unspoiled by developers. We experience true Florida life here. Riverfront/River access - deck repairs are complete. Bathroom is small with only a shower, no tub. Located on a quiet dirt road with neighboring houses along the river. Cottage is directly on the Suwannee River with decks and stairs for river access. Please bring your own beach towels for outdoor use. Newly installed satellite WiFi so you can access the internet to work. We ask that you use only for email, research or surfing the web. No Netflix, Pandora or video downloads, so bring your own DVDs. The kitchen is small, but has full-sized appliances. Large yard for outdoor activities. 1 kayak and 2 canoes. No charge for use, but renters must assume responsibility for use, including putting in water, taking out and cleaning when done. Two decks, one attached at the house (second story) level and one on the riverbank. Cable TV, Digital piano, VCR movies, Music CDs, Coffee, 2 Canoes, 1 Kayak, Paddles, Lifevests, Small firepit outside, private outdoor shower. The cabin was very cozy and had a great view of the river. We loved the stay and the hosts were very easy and friendly! We will return soon! This rental was exactly what we were looking for. Very secluded, very clean and right on the water. It had all the essentials and it was well maintained. The river was right out front and the deck/dock was amazing. The canoes were so much fun also. It was exactly the weekend getaway that we were looking for. The property is beautiful with a great view of the Suwanee. We stayed there and drove to our property in Lee, plus visited Live Oak, Madison, Mayo and Perry followed by a fishing trip to Steinhatchee. The best memories included sitting on the deck and watching the river meander by or looking up at the stars and night in the cool air. We are kayakers and thought about venturing into the river with the canoes on site but was not sure about the conditions paddling back against the current. Great parks nearby as well. Big Al's pizza in Mayo plays great music, and staff are super friendly with a pretty good pizza as well. We hope to come back. Extremely clean, quiet, serene, secluded, affordable, I loved it, the area, and the people. Very cozy, clean, quiet, did not turn on the TV! River at the back yard, secluded, friendly family...on and in.. EXCELLENT!!! Owner's sister is a great author, books available to read!! Thank you! We enjoyed having you! Hope you can make it back sometime! We had a very nice stay here. My wife and I don't get the opportunity to get away very often, and we are glad we picked this property. The view of the river was mesmerizing. We really enjoyed sitting on the deck as the river flowed by. Our stay was so relaxing. It was everything we were looking for. Thank you for a great place to get away and chill! Our 2nd stay here! 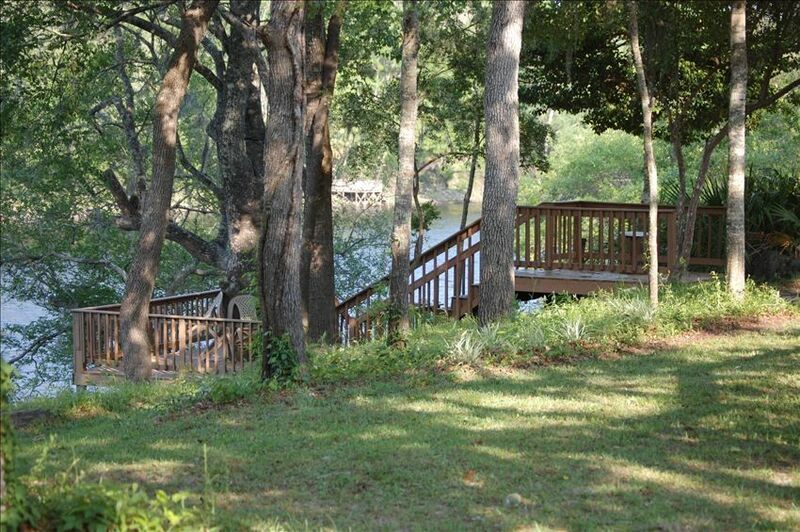 Very private, relaxing getaway on the Suwanee River! River song Cabin is a sweet gem of a place that offers a very nice accommodation and the natural beauty of Florida all around!! Spirit of the Suwannee Music Park, State Parks, Natural Springs, Ichetucknee River Tubing, Lafayette Blue Springs State Park, One hour drive to Wild Adventures Theme Park in Georgia. Please send an email with the dates you would like to stay, so we can check availability. When you are ready to make your reservation, we will send you an email via Pay Pal, where you can pay by checking account, debit or credit card. Rates and nightly minimum are subject to change without notice.